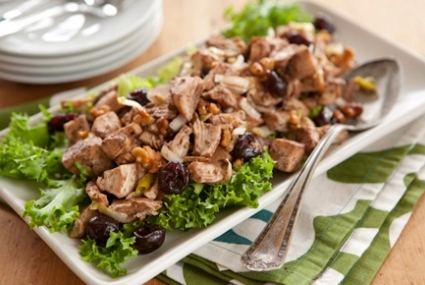 Place chicken, walnuts, cherries and endive in a large serving bowl. In a small bowl, whisk the walnut oil into the balsamic vinegar and season with black pepper. Pour the vinaigrette over the chicken mixture and toss well to coat. Season the chicken with smoked salt and toss gently to combine all of the ingredients. Serve over a bed of frisée lettuce. 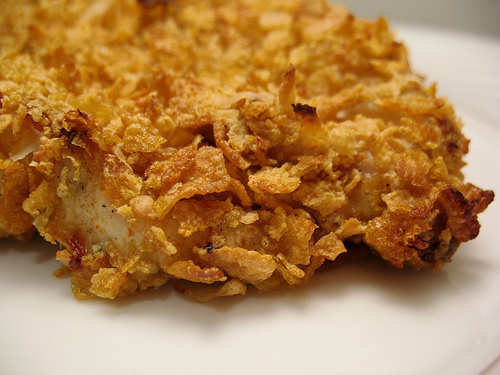 Grammy Kelley’s Oven Fried Chicken ~ Big Flavor, Easy to Make! When I was growing up my Grammy Kelley would sometimes make my brother and I the most amazing oven fried chicken coated in corn flakes. Delicious!!! I was watching Paula Deen yesterday and she made it, reminding me of the amazing chicken my Grammy made for us 35+ years ago. Paula had marinated hers in buttermilk which I never have in the house. I did however have plenty of sour cream leftover from Mexican night and figured I could try marinating in sour cream and milk! It worked well! In just a few minutes I made what is perhaps the BEST freaking chicken I’ve ever made in my life! It was full of flavor, crunchy like fried chicken, moist and juicy goodness. The family LOVED IT! But, the best, best part is it’s soooo easy to make and easy to clean up! No messy frying and far, fewer calories than fried chicken. All around a very good thing! Take sour cream and milk and blend together with hot sauce to taste. Marinate chicken in mixture at least 1 hour to overnight. Line a baking sheet with parchment paper and drizzle about 2 – 4 tablespoons of vegetable oil on pan. Blend together, salt and pepper, garlic powder and parsley flakes into crushed corn flakes. Dip marinated chicken into corn flake crumb mixture and thickly coat each piece. Roll each coated piece of chicken onto vegetable oil on pan and place them apart so as not to crowd pieces. Bake 20 minutes, turn the pieces carefully over and bake an additional ten minutes. *Note* our chicken breasts are HUGE here. If your pieces are smaller, I would recommend reducing the baking time by about 5 or more minutes. Or not cutting the pieces in 1/2, or you’ll risk dry chicken. I am crazy about Thai food! I love the blend of sweet, salty and spicy that they are so well known for. 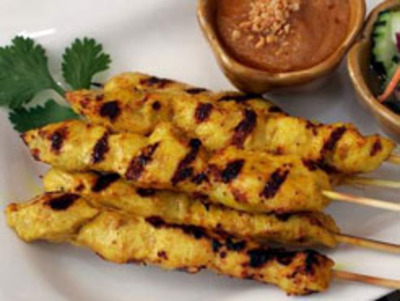 One of my favorite things to order when we go out for Thai, is chicken satay with peanut sauce and cucumber salad. When we moved to the remote mountains of Maine we lost all possible hope to get Thai take out and I set out to find a great recipe to make my own satay. 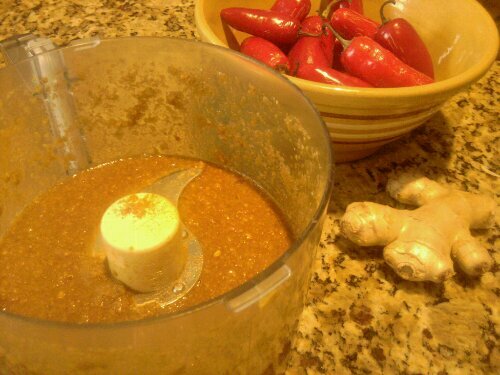 Put all of the marinade ingredients into a food processor and process till smooth. 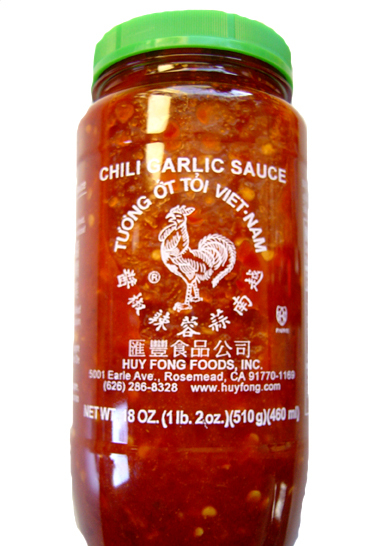 I took a taste of this marinade and it is absolutely divine on it’s own, so I imagine it would be good over plain grilled chicken or if you want to make satay, put your uncooked chicken into the marinade for at least 6 hours or up to 24 hours to develop the flavor. Thread uncooked marinated chicken on skewers before cooking. Grill your chicken about 1 minute per side and it will be quite tender. Cover lightly till ready to serve. Serve with Thai peanut sauce, a fresh Thai cucumber salad and steamed jasmine rice. Combine all ingredients over low heat till the milk and peanut butter have melted together well. This can be made days in advance and reheated. Mix all of the ingredients and let marinate at least 1 hour before serving with satay. Oh, sweet comfort goodness… Sometimes you just have to have it. I make it a practice to try to give our family food that is not only healthy, but yummy as well. Since our two girlies adore chicken fingers (ala frozen yuck…) I accommodate them by making my version. It’s easy and fast and amazingly delicious! They can also be made in large batches, cooked and frozen. Reheat whenever the mood strikes you. I like to serve them with a nice homemade cole slaw and some steamed roasted red potatoes with EVOO and fresh dill. So good! 1. Heat oven to 400°F. Line baking sheet with parchment paper; drizzle with vegetable oil. Between pieces of plastic wrap or waxed paper, place each chicken breast smooth side down; gently pound with flat side of meat mallet or rolling pin until about 1/2-inch thick. 2. In shallow dish, mix together maple syrup and mayonnaise. In another shallow dish, mix together panko, 1/4 c. oil and pecans, cayenne, salt and pepper. 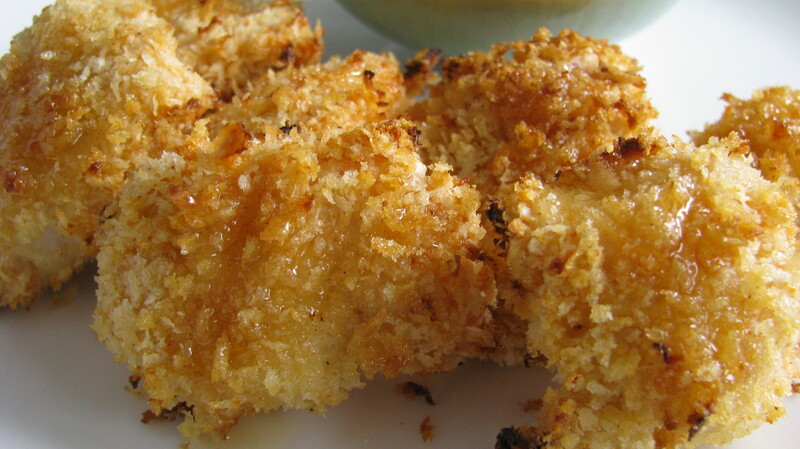 Dip chicken into syrup mixture, then into panko. Place on baking sheet. 3. Bake 15 to 20 minutes, turning once, until juice of chicken is clear when center of thickest part is cut (165°F) and coating is golden brown. Or On ETSY.com ~ Octavias For Some Extra Rad Goods! !